Separate and open bagels. Cut Philadelphia Cream Cheese into 8 cubes. Place one cube on each bagel half and spread. Add one slice of Kraft Swiss Cheese on each bagel half. 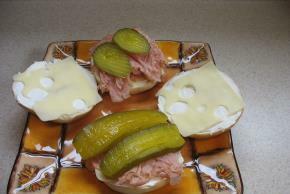 Add half slice of Dutch loaf luncheon meat on bottom side only of each bagel. Distribute ham onto each bottom side of bagel. Then add desired amounts of Bread and Butter Pickles or sliced Dill Pickles. Put bagel sandwich together and enjoy!